Maggie had a litter in 2008 to Relyabull Aragorn and an interbred miniature litter in 2013 to Avindie Great Balls of Fire in which a daughter from that litter has just had her own litter of miniatures in 2015. Maggie has just celebrated her 9th birthday on the 4/4/15 and we hope there is many more to come. Update*** Sadly we lost our dear old Maggie on the 1/5/15 due to tragic circumstances and we are devastated. Sister to Scarlettoro Gold Bullion on our Past Boys page. Mallee had two lovely litters for us, the first with Stardom St Agnes ROM and the second with cracking lad Rhudanna Tui. We have kept a brindle and white female from the second litter "Gertie" to go on with. 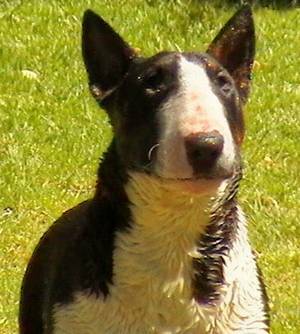 Mallee is now desexed and living in a loving home in Victoria. Thank you Mallee for everything!